The Alliance of American Football is in the midst of its inaugural season, and seems to be off to a solid start. The eight-team league, if nothing else, is giving football fans actual football to watch after both the NFL and college seasons have come to a close, filling a much-needed gap in the schedule. Eminem, it appears, is one of those fans. The legendary Detroit rapper apparently had tuned into the Memphis Express’ game on Sunday against the Birmingham Iron — which also marked Johnny Manziel’s debut. Manziel finished completing 3-of-5 passes for 48 yards and ran for another 20 in their overtime win against Birmingham. The game, though, also featured a brief incident when Manziel could be heard on a hot mic talking trash to a Birmingham defender. It didn’t result in anything major, but Eminem clearly wishes it would have (as evidenced by his all-caps tweet). If he had his way, fighting would be fully allowed in the sport. Charlie Ebersol, the CEO and co-founder of the AAF, actually hit him back less than an hour later. While Ebersol didn’t mention the fighting, he did seem keen on the idea of bringing a future AAF team to Detroit. There are currently six other AAF teams in the league — in San Diego, Phoenix, Salt Lake City, San Antonio, Atlanta and Orlando. There has been discussion about expanding the league, though it’s likely too early to get serious about it, as the first season isn’t complete yet. If all goes well, though, it’s likely that the league will spread to other cities in the near future. 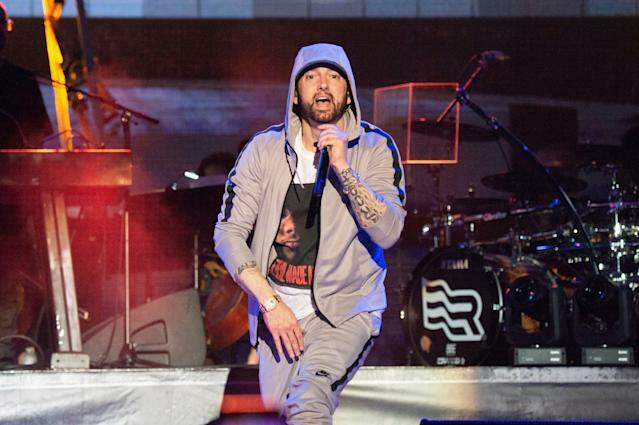 Maybe Ebersol will actually take Eminem’s advice and launch a team in Detroit. And hey, if Bon Jovi can own an arena football team, then Eminem can surely own an AAF team.